craft. 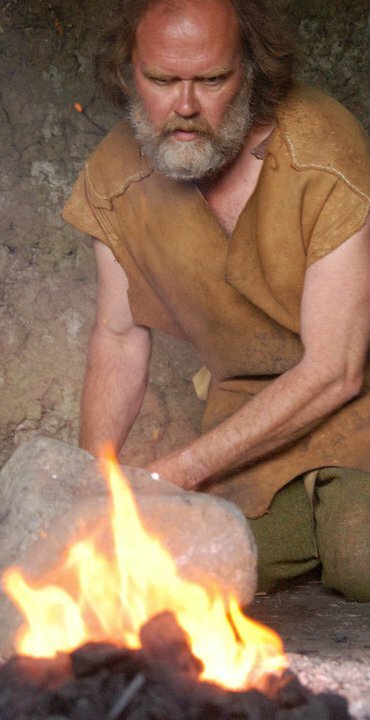 He will be hard at work making and polishing stone axes. He is also is going to be making clothes for the Centre’s mannequin so the lass is dressed entirely appropriately for the Stone Age. This is a great opportunity for visitors to see these rare skills in practice. Mark will be keen to speak to everyone who comes along – he may also be able to let you try your hand at a bit of axe-head making! Mark will be at The Tomb of The Eagles for four days, from Good Friday to Easter Monday, from 10.30 until the centre closes at 5.30 each afternoon. Admission at Tomb of the Eagles is still at its normal price for these four special dates. Mark is one of the country’s most experienced practitioners in the reconstruction of ancient tools, and was Head of Interpretation at Archaeolink near Aberdeen. This work is part of the 2012 celebration of ten great years of the Tomb of the Eagles Visitor Centre. However, the Tomb of the Eagles itself (Isbister Chambered Cairn) has been attracting interest for 5,000 years – albeit with something of a gap until it was rediscovered by local farmer Ronnie Simison MBE in 1958! The demonstrations are funded by the Scapa Flow Landscape Partnership Scheme, supported by Orkney Islands Council, the Scottish Government and the European Community Orkney LEADER 2007-2013 Programme, and the Heritage Lottery Fund. For more information visit The Tomb of the Eagles website.